This Sweet and Sour Chicken recipe brings Chinese take-out home! Sweet and Sour Chicken is a family favorite that so many people love. It’s so easy to make and so delicious! Skip the take-out and make this tasty recipe right at home. 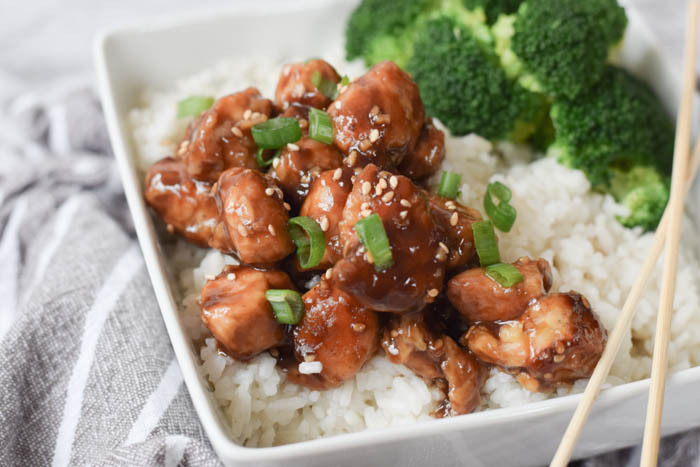 If you’re looking for an easy Sweet and Sour Chicken recipe with delicious sticky, sweet and sour sauce, you’ll have to give this one a try! So good, even my pickiest eaters loved it! This recipe will definitely be one of our family favorites and be requested often. This Sweet and Sour Chicken recipe starts out with breading the chicken pieces. Simply coating each piece in a mixture of flour and corn starch. Then dipping each piece in the egg. Then frying it to perfection. Adding a mixture of green bell pepper and crushed pineapple gives this recipe a nice combination of extra flavors. The Sweet and Sour Sauce is whisked all together and is a perfect balance of sweet and sour! It’s just the right amount of sauce for the breaded chicken pieces to be coated in and adding the amazing flavors to the chicken. The homemade sweet and sour sauce is what really takes this recipe over the top by adding all the amazing flavors it has. This meal is a quick one if you’re needing to get a meal prepared in a hurry. Of course, I am always a fan of those! Prepared and on the table in 30 minutes and the whole family will love it! Enjoy a favorite take-out meal right at home! In a medium bowl, add the flour and corn starch and stir to combine. Dip each piece of chicken into the flour/starch mixture so it is well coated. Repeat with remaining chicken pieces so they are all coated. In a large frying pan, heat the olive oil. In a small bowl, add the egg and pepper; stir to combine. Dip each flour/starch coated piece of chicken into the egg mixture and coat well. Add the coated chicken pieces into the pan of heated oil. Cook until each piece is crispy and golden brown, about 5 minutes and reaches an internal temperature of 165° F. Once cooked, remove the chicken and drain on paper towels. In the same pan, add the pineapple and diced green pepper and cook until pepper is cooked to soften, stirring regularly. In the meantime, make the sauce. Add all the sauce ingredients to a medium mixing bowl and whisk together until well blended. Add mixed sauce to a medium sauce pan and bring to a low boil for 2 minutes, then remove from heat and let set a few minutes to thicken. Combine the cooked chicken, sauce, and the peppers/pineapple mixture and mix together. Serve over cooked rice and with steamed vegetables for a complete meal. In a small bowl, combine the graham cracker crumbs with sugar; pour in melted butter and stir to combine. Press mixture into the bottom of a 9” springform pan. Bake at 350° F. for 7-9 minutes. Let cool. In a double boiler, melt the BAILEYS® baking chips with the half and half until smooth; set aside. In a stand mixer, blend together the cream cheese and sugar until smooth. Scrape sides of the bowl and turn mixer back on low. Add eggs, espresso and vanilla and mix until well blended; scraping sides of the bowl as needed. Pour in the slightly cooled BAILEYS® baking chips and half and half mixture; blend until combined. Pour mixture over the cooled crust. Wrap the outside of the springform pan with heavy aluminum foil making sure to wrap it up the sides of the pan. Set the springform pan in a larger baking pan with at least 4-inch sides. Pour hot tap water into the baking pan until it comes up ¾ of the way up the sides of the springform pan. Bake at 350° F. for 1 hour to 1 hour and 10 minutes; cheesecake is done when the center reaches 150° F. Turn off oven and open the door; allow the water to cool. Carefully remove pan from the oven and then remove springform pan from baking pan; remove foil. Allow to cool on a wire rack for 20 minutes then place in the refrigerator for at least 4 hours or overnight. To remove from pan, gently run a knife around the edges of the cheesecake before releasing the springform pan. Topping: In a small bowl, stir all ingredients until well blended. Pour over the top of the cooled cheesecake and spread to the edges. If desired, drizzle the sour cream topping with melted BAILEYS® baking chips; use a knife or offset spatula to create swirls of chocolate on the top of the cheesecake. Store in the refrigerator before serving. March 25, 2019 April 2, 2019 Chocolate! 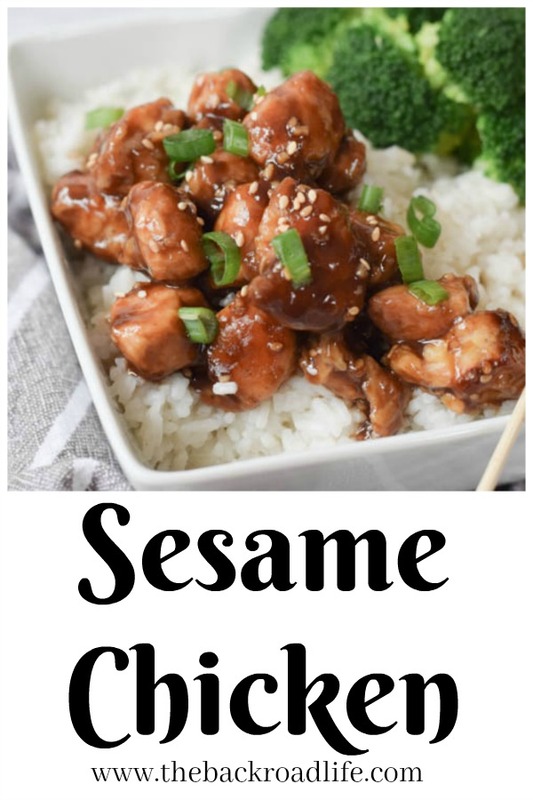 This Sesame Chicken recipe is so flavorful and delicious, you’ll want to add it to your meal plans. It’s one of those favorite take-out meals that can be made right at home. Pair with some vegetables and steamed rice or quinoa and you’ll have a simple, complete, and tasty meal that is budget friendly as well. You’ll love adding this easy recipe to your weekly meal plans. This Sesame Chicken starts with pieces of chicken, I generally use chicken tenderloins or breasts and cut into bite size pieces. The pieces are then simply coated with eggs and corn starch/flour, then fried to crispy perfection and golden brown. After the chicken is done, it is tossed in the delightful sesame sauce to create our dish and ready to serve. For best dish results, you’ll want to serve the chicken immediately, as the crispy coating will start to soften after it has been coated in the sauce. 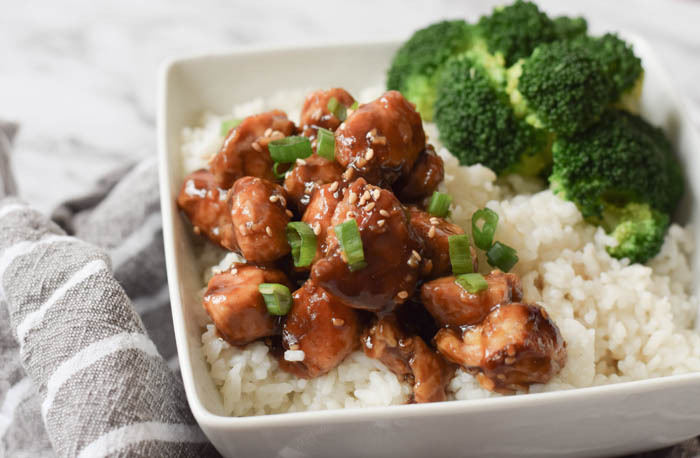 Enjoy the sesame chicken over steamed rice with some of your favorite vegetables. In a small bowl, add the egg and pepper and stir to combine. Add the flour and corn starch into another bowl and stir to combine. Dip each piece of chicken into the egg mixture, then roll into the flour mixture. Repeat with all the chicken pieces so they are all coated. In a pan, heat the olive oil. Add the coated chicken pieces to the pan. Cook until each piece is crispy and golden brown, for 5 minutes or until the middle reaches an internal temperature of 165° F. Drain the chicken on paper towels to remove any excess oil and remove any extra oil from the pan. For the sauce, add all the sauce ingredients to a medium mixing bowl. Whisk in the corn starch until the mixture is well combined. Place the crispy chicken back into the pan and pour the sauce over top in the pan. Bring the mixture in the pan to a quick boil, and then simmer for 3 to 4 minute or until the sauce has just thickened. Served the sesame chicken over steamed rice with your favorite vegetables. Sprinkle with sesame seeds and green onions and serve. We’ve featured Guinness Pie in cooking classes and our First Friday local events. Our executive chef, Mandy Shook, walks you through making this pie at home. At heart, it is really a beef stew sealed inside flaky puff pastry-making a savory main dish your family will line up for! Saute onions in a large pan at medium high heat with a little salt, and pepper until slightly browned. Stir in the rosemary and the minced garlic. Add 1 Tbsp. butter. Add celery, carrots and mushrooms. Cook 2-3 minutes. Add the beef. Stir in 1 heaping Tbsp. flour. Season with a pinch of salt and pepper and pour in the Guinness. Cook over medium heat for about 2 hours until cooked down and beef is tender. Remove from heat. Stir in 1 C. of shredded white cheddar cheese. Roll out puff pastry to about 1/4-thick. Line the bottom of an oven safe bowl or pie pan that is about 4 inches deep and 8-10 inches in diameter with the puff pastry. Pour in the stew filling. Sprinkle shredded cheddar cheese on top of stew filling. Cover with another piece of puff pastry. Press around the edges so the top puff pastry is sealed to the bottom puff pastry. Score the top of the pie to vent. Brush with beaten egg. Bake the pie at 350° F. for 40 minutes or until bubbly and golden. Recipe by Executive Chef Mandy Shook. Watch the video on how to make Guinness Pie on our YouTube channel! Preheat the oven to 350° F. Line two baking sheets with parchment paper. In a large mixing bowl, cream the butter and sugars together until thoroughly combined and the mixture becomes light and fluffy. Add the eggs, one at a time, and mix until completely incorporated. Add the vanilla, brewed espresso and mix to combine. Add the flour, Clabber Girl Baking Soda, salt and espresso powder. Mix until thoroughly combined. Stir in the BAILEYS® baking chips. Scoop out the cookie dough (about 2 Tbsp. size scoops) onto the baking sheet, 2-inches apart. Bake cookies at 350° F. for 10 to 12 minutes. Yields 2 dozen cookies. In a large bowl, combine the cereal and pretzels; set aside. In a medium saucepan, combine the peanut butter, butter, BAILEYS® baking chips and vanilla. Whisk over low heat until melted and smooth. Pour the mixture over the cereal and pretzels and stir to coat. Transfer the coated mixture to a large resealable bag. Add the powdered sugar. Seal the bag and shake well until everything is coated in the powdered sugar. Spread the mixture out on a parchment lined sheet tray and allow to cool and dry. February 8, 2019 April 3, 2019 Chocolate! Are you looking for an easy and comforting meal to make for dinner? A meal that is warm, creamy and delicious? Packed full of hearty filling of vegetables and chicken and topped with the sweet cornbread topping? This Cornbread Chicken Pot Pie is made from scratch and large enough to feed a large family with some leftovers to spare. Perfect for those cooler months when you’re craving comfort food! We are in the heart of winter here in Indiana with this unusual Polar Vortex going through. This week we have had cold temperatures reaching in the -40/-50s with the wind chill. School has been canceled, my husband’s work has been closed. We haven’t left the farm. It’s a great time to spend cooking, and we have done a lot of it. This homemade Cornbread Chicken Pot pie doesn’t disappoint. Quick. Simple. Tasty. A delicious all-in-one meal. Place the frozen vegetables in a large sauce pan and cover with water. Over medium high heat, bring to a boil. Cook vegetables until they are tender, about 5-10 minutes. Drain and set the vegetables aside. In a small saucepan, melt the butter. Add the chopped onions and sauté for 2-3 minutes until just barely tender. Add chicken broth, salt, pepper, flour and corn starch. Stir until well combined. Then add the cream and stir continually while cooking until the mixture thickens, about 4-5 minutes. Pour sauce mixture over vegetables, add the cooked chicken and stir everything together until coated well with the sauce mixture. Spoon the vegetable mixture into a greased 9×13-inch baking dish and set aside. In a large mixing bowl, add the cornmeal, flour, sugar, baking powder and salt, and stir to combine together. Add the milk, melted butter and eggs. Stir together just until mixture is well blended and smooth, there may still be small lumps in the batter. Be careful not to overmix. Spoon the cornbread mixture on top of the vegetable mixture in the baking dish. Spread out the cornbread mixture to cover the filling. Bake at 400° F. for 20 -24 minutes, until the cornbread is golden on top and a toothpick inserted in the center comes out clean. Enjoy this Cornbread Chicken Pot Pie next time you’re looking for a hearty meal! Preheat oven to 350° F. Place a rack in the center of the oven. Doughnut batter: Cream butter and sugar. Beat in the eggs, one at a time, until just mixed in. Sift together the flour, baking powder, baking soda, salt and BAILEYS® baking chips. Add dry ingredients to the butter mixture. Then add milk. Mix until well combined and smooth, but don’t overmix. Grease the doughnut pans. Scoop batter into pans and fill halfway (these will rise quite a bit). Bake for 10-13 minutes. Cool for about 10 minutes and remove from the pan. Chocolate Glaze: In a medium saucepan, combine milk, heavy cream, sugar and Clabber Girl Corn Starch. Whisk together until the mixture comes to a boil. Remove from heat. Whisk in the BAILEYS® baking chips until they are melted, and the glaze is smooth. Use a fork inserted in a doughnut hold to dip one side of the doughnuts into the glaze, then flip and dip the second side. Move the glazed doughnuts to a cooling rack with wax paper underneath to catch the drips and allow the glaze to harden before serving. January 10, 2019 April 3, 2019 Baking, Chocolate! Are you looking for a fun and super flavorful dessert for Valentine’s Day? Give these Red Velvet Brookies a try! They are delicious! You can’t go wrong with red velvet and chocolate chip cookie dough. Red Velvet Brookies are such a fun treat for Valentine’s Day combining two favorite desserts in a fun twist. A cookie and a brownie in one, creating a Brookie, the best of both worlds! Although, it’s not quite Valentine’s day yet, but it’s that time of year when all things pink and red start popping up in all kinds of stores and online right after Christmas. Some things I think about when it comes to Valentine’s Day is chocolate, sweets, and the color red. This sweet treat ties them all together and is packed full of flavors. This dessert is deliciously comforting just like red velvet brownie and chocolate chip cookies should be. These Brookies are perfect for the lovely holiday, but they can be made any time for sure. This recipe features the new BAILEYS® baking chips and adding mouth watering flavors of BAILEYS® Original Irish Cream. Be sure to enjoy these with a glass of milk. They are decadent and delicious! Line a 9 x 13-inch baking pan with parchment paper or grease it well and set aside. In a large bowl, mix together the red velvet cake mix, vegetable oil, milk and egg until well blended. A smooth, thick batter forms. Spread the batter in the parchment lined/greased baking dish. If the batter is thick and sticky, it may be helpful to spray the spoon before spreading the batter in the dish. Set aside. Beat together the butter, sugar and brown sugar together until nicely smooth and creamy. Add in the egg and continue to mix. Add in the baking soda, baking powder, vanilla and salt; mix well. Add the flour and mix until the dough forms. Add the BAILEYS® baking chips and mix in gently with a wooden spoon. Drop small spoonfuls of the cookie dough on top of the brownie batter in the baking pan. Gently spread out until the brownie batter is completely covered to create the top layer. Bake at 350° F. for 35 to 40 minutes, until lightly browned on top and a toothpick inserted in the center comes out clean. Let cool for 15 minutes until cutting and serving. Cut into small square bars. For extra chocolate goodness, place 1/2 cup of BAILEYS® baking chips in a glass dish and melt in the microwave for 30 second intervals, stirring in between until melted. Using a fork, drizzle over the Brookie squares. In a small bowl, combine all ingredients except the bailey’s chips until combined. Stir in BAILEYS® baking chips. Spoon the mixture into a 16 oz. mug. Microwave on high 1 1/2 minutes, until top has set.